Picea Glehnii is a spruce tree, on it lives a fungus called Penicillium Damascenum; a seed-epiphytic fungi, between them (I believe), they produce a substance known as citrinin, this substance helps prevent "damping off" a fungal condition which affects the roots of the spruce. Now as we know many of our native hardwood species are threatened by one or other of the Phytophthora genus fungi (primarily Ramorum). I have researched the efforts which are being made to deal with the Phytophora outbreak but so far conventional methods are not providing the answer, I therefore contacted "The Woodland Trust" and suggested that "thief for thief" research into epiphytic/symbiotic methods could provide one. Thing is, I first saw mention of Penicillium Damascenum in the top left-hand corner of a page in "Gardener's World"*! Mushrooms are a nutritious, healthy food source that can be grown off many agricultural and urban waste products. Mushrooms can be grown off of paper waste, coffee waste, and many weed plants including Scotch Broom and Water Hyacinth (one of the fastest growing plants in the world). A global understanding of mushroom cultivation could easily help end world hunger. Many mushrooms are potent medicines able to reduce tumor rates, boost human immune system vitality, and reverse dementia. Fungi, like other natural medicines, provide a powerful preventative alternative to the destructive and harmful practices of allopathic medicine. Decomposing mushrooms can break down toxic and persistent chemicals, clean polluted water, and potentially break down plastic. Mycorrhizal fungi can be cultivated to build top soil, enhance soil ecology, support plant health, and reduce fertilizer consumption. Entheogenic (psychedelic) fungi can help transform the human perception on the purpose of life; potentially opening the willing individual to embrace an understanding that all life must be valued and protected. Further, we hope that the individual will take these insights to heart and make tangible change in the world and not see these insights as the last step in the process of transformation. Some fungi ferment foods, making them more nutritious and easy to preserve. Fermented foods enable a person to live off the grid while preserving traditional food ways. Mushrooms and fungi integrate into permacultural systems to create perpetual food systems, helping enable a person to live off the grid. Mushrooms can be made into dyes, paper, clothing, and pigments leading to increased self sufficiency though the production of natural products. Mushroom identification and wild harvesting hones one’s awareness and understanding of forest ecology while providing for sustenance. Identification of endangered fungi and lichens can be used to help defend forests from clear cutting. Mushrooms can potentially be used to build (or at least insulate) living structures. Yeasts and other microorganisms can create methane and other fuel sources through their natural fermentation processes. Here we have fungi offering tangible solutions to issues of food scarcity, water quality, chronic disease, pollution levels, soil health, emotional/psychological/spiritual health, housing and more. Beyond all this, the acceptance of fungi into one’s daily life can manifest a perspective on the world that recognizes the interdependence of life as one learns how fungi literally connect the organisms of the world and maintain the health of whole ecosystems. Based on the above, one should ask themselves why are we taught to fear or ignore fungi in western cultures. The use of the word “radical” to describe our approach to the science and culture of mycology is based on several factors. First, we see the use of fungal species for environmental betterment as an extension of radical/deep ecology, which considers all of the Earth’s inhabitants as having an inherent value and interdependence. Second, through the use of fungi to improve personal, societal, and environmental resilience, we are working to shift perceptions about mushroom and mycology as a fringe subject to something central and critical to all life processes and solutions to global issues. Third, the word “radical” comes from the Latin “radix” which itself means “root.” Many of the applications of mycology and the lessons that can be learned from their biology literally get to the root of global problems in a solution-oriented approach. Issues such as food shortages, water purity, soil fertility, pollution reduction, and democratic organization can all be addressed and informed through the directed use of fungi. Finally, as stated above, the techniques and concepts we highlight in the Radical Mycology website and Convergences are rather cutting edge, and in this sense “radical” or extreme in comparison to the traditional interactions of humans with fungi. As the years progress, one can more readily see the impacts of pollution and environmental destruction increasing alongside a need to find appropriate and effective strategies to address them. Climate change, increased rates of disease, reduced access to clean water, and the mass extinction of species are just a few of the issues underlying a need to find alternative solutions to meeting basic human needs while sustainably stewarding the planet. We at Radical Mycology do not believe that fungal remediation or the creation of a more mushroom literate society is the sole solution to such problems. The true solution to these issues comes from eliminating the conditions that enable them to exist (e.g. economic structures that require growth at all costs, poorly designed industrial systems, over-consumptive societies, and political climates that disable the individual from having their concerns truly heard). We do not believe that mushrooms alone can save the world. We support a diversity of tactics in addressing any given challenge. That said, we do believe that the fungi are powerful allies in the struggle to help restore the planet from the social and ecological challenges that it faces. We see the cultivation and application of fungi as a solution-based approach to countering the destructive practices of governments and industries that should be used in conjunction with more front-line tactics such as projects to educate and increase awareness, direct action campaigns, and even legislation reform. We believe that the uses of mushrooms and other fungi are incredibly important tools for the change-maker tool box. And, unfortunately, are some of those that are most often overlooked. One of the things that distinguishes the Radical Mycology project from some of the other aspects of the world of mycology is that the mycological work that we support is based on an anti-oppression ethos and doesn’t rely heavily on globalized, industrial, and destructive economic models. We also see learning skills such as mushroom cultivation, mushroom hunting, medicinal mushroom processing, and the consumption of entheogenic fungi as tools that help us live outside of such destructive systems. We seek to build a Radical Mycology movement that is a part of a larger social, political, and environmental justice movement in the modern context of constant change. We hope to add to the discussion on how to move away from practices that are counter productive to supporting life and to begin making tangible, positive changes toward a healthier and more holisitic world. The Radical Mycology project began as an idea between two friends (Maya and Peter) 7 years ago when they met while working on volunteer projects related to ecological and social justice. Weaving the seemingly unrelated fields of mycology, environmental justice, systems theory, and social organizing together, the two developed a novel perspective on using fungi to help create a better world that was framed in a social and political context. They realized that the importance of fungal ecology was missing from many environmental justice dialogues such issues of forest protection and global pollution and how crucial the science of mycology is to fully developing these debates. They also realized that there was also much to learn from the fungi and their mycelial networks for how to best structure society into a more cooperative and egalitarian model. On all levels, it seemed, the fungi exemplified many successful and sustainable models that human activity could learn from. Discussions between the two soon evolved into an entire social philosophy based on the value of seeing the fungi as teachers and allies in the global struggles of creating a more healthy and just world. In time, Peter wrote a zine (or booklet/pamphlet) entitled Radical Mycology that encapsulated these ideas so as to share them with other mushroom enthusiasts and socially-conscious individuals. The zine quickly became quite popular and the positive feedback it received eventually inspired Maya and Peter to organize the first, second, and upcoming third Radical Mycology Convergences (RMCs). Modeled after the networked and collaborative structure of mushroom mycelium, the RMCs are donation-based events that teach the skills of low-cost mushroom cultivation and bioremediation while building a supportive community of like-minded mushroom enthusiasts and environmental justice supporters. The Radical Mycology project is a volunteer-based organization dedicated to educating the world on the benefits of the fungal kingdom for personal, societal, and ecological well-being. 1. To develop a more educated and respectful understanding of the fungal kingdom in humans (especially in western cultures). 2. To provide free, accessible, and concrete information on the uses of fungi for social, ecological, economic, psychological, and medical justice. 3. To promote the use of fungi in more holistic, sustainable, and resilient lifestyles. 4. To promote the values, ethics, and concepts of radical/deep ecology, permaculture, and systems theory through the metaphors inherent within fungal biology. 5. To find, develop, and disseminate tangible solutions to pressing global issues such as food scarcity, chemical pollution, economic disparity, and the rise in chronic illnesses through the cultivation and application of fungi. 6. To develop safe and effective remediation protocols for emergency disaster response using fungi and other organisms. 7. To provide the means for easy, friendly, and supportive networking among bioremediators and mycologists of all backgrounds and skill levels. 8. To encourage the development of a more science-literate popular culture, thereby creating more citizen scientists who are well-equipped to analyze and address world issues involving the hard sciences of chemistry, biology, and ecology in an informed and educated manner. 9. To promote the growth of native fungal species to encourage genetic diversity and strengthen local food and soil webs. 10. To combine all of the above into to a force that will create significant and positive societal change. 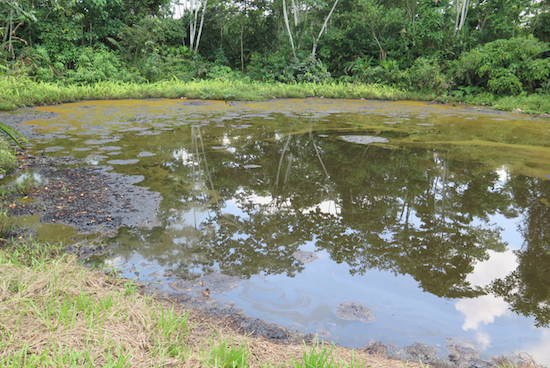 An unlined oil waste pit in the Amazon rainforest. Quote: "Oil companies have left a huge mess in the Ecuadorian Amazon. There are over 1000 unlined waste pits seeping toxic chemicals into the soil and water throughout the rainforest, contaminating the land that many indigenous people and other Ecuadorians live on. Oil companies, such as Chevron, have done everything in their power to avoid paying to clean up the mess. This is what inspired three women to start the Amazon Mycorenewal Project, a bioremediation plan using microbes to clean up toxic waste, and work with Ecuadorian locals. We spoke to Project Coordinator Lexie Gropper about what they are doing and what they hope to accomplish. What is the Amazon Mycorenewal Project? Why was it started? The Amazon Mycorenewal Project (AMP) operates as a 501(c)3 sponsored organization, championed by a diverse group of volunteers who are collaborating to develop biological solutions to environmental pollution. In 2006, three women combined their diverse knowledge and researched natural methods for remediation of petroleum contamination. Based out of the Sucumbios province of Ecuador, AMP’s current research involves designing and testing biological filtration systems aimed at reducing and decomposing petroleum contamination before it enters aquatic ecosystems. Often called the “lungs of the Earth,” one of the world’s most biodiverse regions per acre, the Ecuadorean Amazon has a history of industrial resource extraction and leaving behind expansive crude oil contamination. What is bioremediation? Describe a little about how the renewal project works. Remediation aims to ameliorate toxicity and reduce the impact of contamination on degraded landscapes. Conventional remediation tends to be quite expensive and halts after reducing the visibility of exposed pollutants. Conventional remediation in terrestrial systems often involves relocating or burying the contamination; however, neither is considered an authentic remediation technique. In contaminated sites in Ecuador, buried petroleum rises to the surface or leaches into ground and surface water when it rains (which is daily in a rainforest!). Conventional remediation practices used for contaminated water systems typically add chemicals, such as dispersants, to clean the watersheds. In the remediation of the Deepwater Horizon oil spill in the Gulf of Mexico, chemical dispersants sank oil to the bottom of the ocean, until it was invisible to the surface –deeming the remediation complete. The beauty of bioremediation is that it doesn’t hide the contaminants away from view, but actually works with living organisms to biodegrade chemical compounds into benign molecules that are non-toxic to ecosystems. Bioremediation is based upon the wisdom of nature, and harnesses the processes of numerous organisms that function as filter feeders or decomposers in natural systems. Pachamama transforms and recycles nutrients to nourish all of her inhabitants; hence, there are no waste products in nature! AMP is building relationships with biological communities in the Amazon to mimic these decomposition and recycling processes. We are amplifying the combined abilities of native fungi, plants and bacteria to physically decompose toxic chemicals and bind heavy metals, thus purifying soils and water. Many bioremediation applications commonly only use one trophic system like either mycoremediation (fungi), bacterial remediation (bacteria), phytoremediation (plants). However, AMP is utilizing the combined capacity of these approaches; our biofiltration system redirects water to flow through fungi, bacteria, and plants sequentially. Fungi play a pivotal role in our designed filtration systems, just as they do in nature. Among many roles, decomposer fungi recycle plant litter and organic matter into bioavailable nutrients for bacteria, plants, and animals. First, decomposer fungi release enzymes that biodegrade lignin, a structural component of wood. Then, they transform this decomposed lignin into available sugars. Lignin is a polyaromatic hydrocarbon (PAH); a carbon based compound, with long chemical chains and recalcitrant structures that are difficult for most organisms to decompose. The chemical structure of petroleum is also a PAH; this enables the fungal metabolic enzymes to break down recalcitrant petroleum compounds into bioavailable sugary food sources. Bacteria play an important role in the decomposition process, too, as they are voracious carbon consumers. In addition, plants can hyper-accumulate (bind) heavy metals into their plant biomass. After utilizing plants, microbes and fungi to reduce petroleum contamination in our designed system, all biological components will then be composted and planted with hardwood trees to continue the nutrient cycles within the ecosystem. What kind of organisms are you using? When experimenting with living organisms in situ (on-site location and not constrained to a laboratory), we strive to work with the local organisms, as to not introduce invasive species to sensitive watersheds. AMP is working with native fungi, plants, and bacteria found growing in and around the oil-contaminated sites. These organisms have evolved to tolerate high concentrations of crude oil, therefore they are petro-tolerant (able to withstand petrol) or petro-philic (eating and living off of the petrol). Describe some of the challenges you face as you implement a renewal project in another hemisphere. As foreigners, we aspire to earn the respect of the local inhabitants of the region, as well as raise support for the longevity and implementation of our research. However, as a volunteer-based project, it is difficult to maintain volunteers for long periods of time in another country. Research about biofiltration is applicable worldwide as resource extraction seems to show no boundaries. But, it can be challenging to obtain funding for laboratory testing when we’re working in another hemisphere because many donors tend to support projects from their local bioregion. We only have a few days left in our campaign. Our campaign will support laboratory testing of petroleum contaminated water pre- and post-exposure to our system. With further testing and modification, AMP will design a biofiltration system that is scalable and replicable for use with communities afflicted from resource extraction worldwide. Who are your Ecuadorean partners? How is AMP working with the local people to clean up the rainforest? How are you working with the Ecuadorian government and universities? AMP is continuing to develop relationships with local people in hopes that local inhabitants will continue this bioremediation research and further implement efficient cleanup. AMP has taught remediation courses to local and international people, as well as hiring local people to assist in the installations. We have been collaborating with universities to further develop our experimental design and quantitative analyses; this will allow local students and professors to get more involved. We have given bioremediation presentations to the Ministry of Environment and oil companies in hopes of expanding our networks to augment the implementation of natural and effective remediation techniques. It is important for our project to have the support of the local people. We believe that the indigenous and local people should be empowered to decide the ultimate fate of the land. AMP aims to provide techniques for reducing oil contamination before it enters aquatic systems and ameliorating the impacts of previous and current methods of oil extraction. At the same time, AMP does not want to put a band-aid on oil pollution,unintentionally supporting the continuation of oil exploitation, or greenwash industrial extraction methods without addressing the root cause of the problem. What are your ultimate hopes & goals for AMP? In an ideal world, what will you accomplish? It is AMP’s overarching goal to train local people and remediation crews and perform research and implementation of bioremediation technologies. We plan to design modular filtration systems that are simple enough to be replicated to numerous unlined oil pits throughout the region. However, it would be ideal for our systems to be applied to the point-source of the contamination to experience the greatest remediation impacts. Therefore, it may be industrial or governmental systems that will ultimately apply these bioremediation methods at a larger scale. In an ideal world, bioremediation would become more integrated into conventional remediation protocols, with trained first responders able to apply bioremediation technologies to augment disaster response. Until then, AMP intends to strengthen our networks to disseminate information and encourage motivated people to step into the role of a bioremediation responder, when necessary. We plan to publish our protocols, designs, and results of our experiments in open source journals, to serve as a resource for individuals and communities worldwide. What a world it would be to see anthropogenic waste products commonly transformed and recycled into nutrients to support the biodiversity of the planet! Quote: "Some may have seen a recent BBC science series called "The Brain a Secret History" on which the presenter Micheal Mosley was given crystal psilocybin-psilocin*, which is currently being tested as an anti-depressant**. Is this otherwise Class A Drug going to be extracted or synthesised and then marketed and prescribed? As with cannabis our society has a schizophrenic attitude towards psychoactive fungi. **He was then placed in a "C.A.T" scanner ( http://en.wikipedia.org/wiki/X-ray_computed_tomography ), not something I would have done (I have personal experience of the C.A.T-scan procedure -never again!-). Quote: "Researchers Extol The Medical Benefits Of Magic Mushrooms. Researchers at Johns Hopkins University School of Medicine have been studying the effects of psilocybin, a chemical found in psychedelic mushrooms. Now, they say, they’ve zeroed in on the perfect dosage level to produce transformative mystical and spiritual experiences that offer long-lasting life-changing benefits, while carrying little risk of negative reactions. The breakthrough could speed the day when doctors use psilocybin–long viewed skeptically for its association with 1960s countercultural thrill-seekers–for a range of valuable clinical functions, like easing the anxiety of terminally ill patients, treating depression and post-traumatic stress disorder, and helping smokers quit. The Johns Hopkins study involved giving healthy volunteers varying doses of psilocybin in a controlled and supportive setting, over four separate sessions. Looking back more than a year later, 94 percent of participants rated it as one of the top five most spiritually significant experiences of their lifetimes. Quote: " Much of the construction industry depends on fossil fuels, creating a big carbon footprint. As pressure mounts to make construction “greener”, experts have started to design houses out of hemp and straw, and bricks made of mushrooms. From a distance, it looks like something out of a desert landscape, ancient and handmade. The closer you get, the more you see something much more modern in the curves of this tower, assembled from 10,000 bricks. But it is only when you examine one of those bricks close-up that you get a sense of what the future might hold. 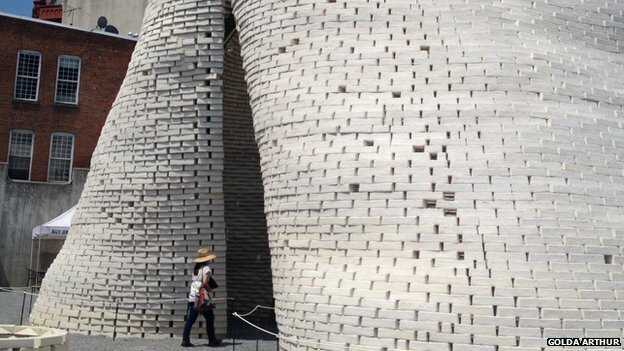 Using bioengineering, this structure has been made from mushrooms. “This is a hybrid of what I call an ancient technology of mushrooms and a totally new technology of computation and engineering,” says architect David Benjamin. The mushroom – or mycelium, the vegetative part of the fungus – is an ideal material, Mr Benjamin explains. These bricks score high marks for sustainability because they were “grown” with no carbon emissions and no waste. The 40ft (12m) structure he is referring to currently sits in a courtyard at MoMA PS1, an art gallery in New York. The mushroom brick is “grown” by mixing together chopped-up corn husks with mycelium. The mixture is then put into a brick mould and left to grow for five days. The result is a brick that is solid, but lightweight. 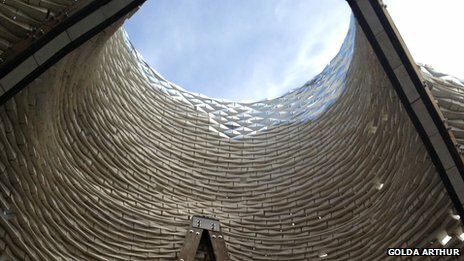 The “mushroom tower” is then assembled using a custom algorithm to lay the bricks layer by layer. This method lets builders use local materials like agricultural waste, and also makes the bricks biodegradable. These particular bricks were created from materials in the New York area. But the method can travel. In places where rice is abundant, people can use rice hulls in the mixture with mycelium to create bricks. Mr Benjamin’s belief in the power of biotechnology is evident in the name of his architectural firm, The Living. Meanwhile another architect has also been growing “bio-bricks”, using a different process. Ginger Krieg Dosier is the creator of a brick made with sand and bacteria, filled into a mould and then fed with a nutrient solution. Five days later, the bricks are removed and ready to use. The chemical reaction caused by this mixture “bio-cements” the grains together to create a solid brick. This quest for the bio-brick took Ms Dosier from the world of architecture to science, where she consulted with microbiologists and chemists in order to come up with a formula. “Even as a child, I have been fascinated with how nature is able to produce durable and structural cements in ambient temperatures,” she says. Her brick is now being used in a pilot project to make paving. She worked for a while in the United Arab Emirates – where sand, of course, is plentiful – but has now relocated her company, BioMason, to North Carolina. The work of Mr Benjamin and Ms Dosier point to a new level of innovation which some say is much needed in the building industry. “While they are experimental, it is very exciting to see these types of leapfrog technologies that take cues from nature to find creative alternatives to some of the oldest conventions in design,” says Jacob Kriss from the US Green Building Council. The council is responsible for a rating system called LEED, which rewards sustainable design in buildings. Mr Kriss says the building sector is responsible for almost 40% of carbon dioxide emissions in the US. “There is an unquestionable imperative to green our stock of both new and existing buildings,” Mr Kriss says. Source – BBC News Magazine "
*Quote: "The Woodland Trust also favours a different approach. The organization is investing £1.5m in a seed bank. The idea is to grow trees that are fully traceable and therefore free from foreign disease. It's not just fungi of-course, certain reeds and grasses bio-accumulate both chemical and radiological toxins and I am certain that we will find that the same is true of some of the seaweeds, this will be the way we clean the oceans. Can we imagine a stable organic "gelly" we could pack into flasks and blast at the Sun? Something that would "capture" the radio-nuclides and help avoid dispersal should there be an accident? See..